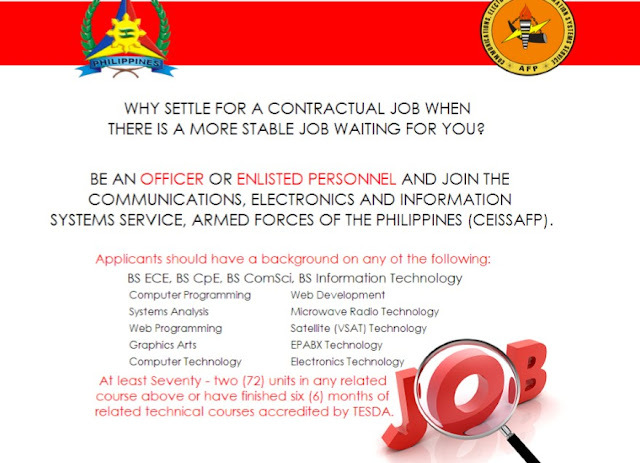 How to Apply ICT Jobs in the Armed Forces of the Philippines #CEISSAFP #NUP - Exam News, Reviewer, Military Career, & Everything [MN] . .
Are you an IT fresh grad or professional seeking a stable –for- life job? Here’s the good news for Pinoys. The Armed Forces of the Philippines (AFP) is inviting IT professionals and fresh grads to fill up agency's technical positions as Non-Uniform Personnel (NUP) or also known as Civilian Employees. The Communications Electronics and Information Systems Service of the Armed Forces of the Philippines (CEISSAFP) is in need of the following experts in Computer Programming, System Analysis, Web Programming, Graphic Artists, Web Developement, Microwave Technology, Satellite (VSAT) Technology, EPABX Technology and Electronics technology. Education : BS ECE, BS CpE, BS ComSci, BS Information Technology, BS Mgmt Info Sys – at least two(72) units in any related course or have finished six(6) months of related technical course accredited by TESDA. Certifications if any : Microsoft, CCNA, CompTIA, Oracle, JAVA and other relevant certifications. Guaranteed job in the AFP as member of the Army, Philippine Air Force or Philippine Navy after graduation from training. Free medical and insurance benefits including direct dependents.